The electricity you use in a month is broken up into two tiers. It may be helpful to think of tiers as usage levels. As you use electricity during the month, you move up from one tier or usage level to the next and the price you get charged goes up. Your baseline allowance is for basic needs such as heating, cooking, lighting, and refrigeration. You start off the billing cycle in Tier 1. Tier 1 is usage up to 130% of your baseline allowance. You can find your baseline allowance on your bill by the meter number. Multiply this number by 1.3 to find your Tier 1 usage amount. In Tier 1 your usage gets billed at the lowest rate per kWh. But once you’ve used this amount you move up to Tier 2. Tier 1 is the least expensive. Tier 2 costs more. Managing your energy use so that you stay in tier 1 can lower your overall bill. 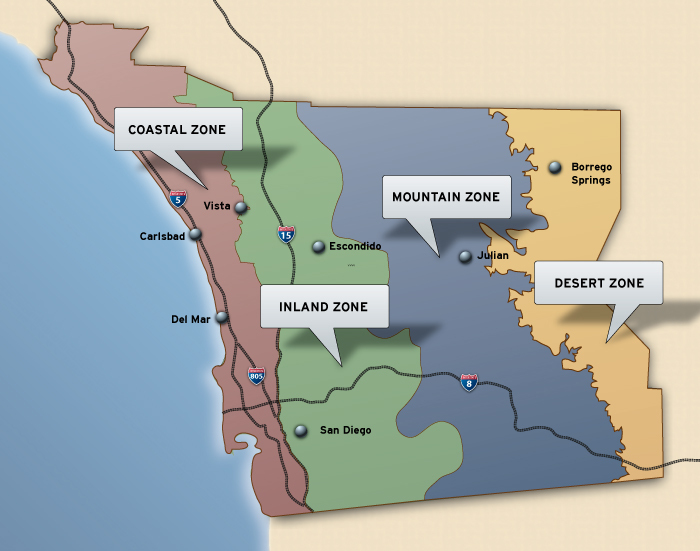 SDG&E’s service area is divided into four different climate zones: (1) Coastal, (2) Inland, (3) Mountain, and (4) Desert. Each climate zone is assigned different daily baseline allowances. Baseline is a “per day” amount, so months with more billing days receive more baseline. Baseline also varies between summer and winter, and by how you heat your home. The daily baseline allowance varies by season. For residential customers, the summer season is defined as May 1 through October 31 and the winter season is defined as November 1 through April 30. Customers that receive both electric and natural gas service, will have different baseline allowances (basic service baseline allowances) than customers with all electric service (all electric baseline allowances).